Everyone deserves equal justice under the law, and every American has the right to vote, raise their voice, and participate fully in our democracy. Despite progress over the last century, our nation and our county still have deep inequities. Racial discrimination is illegal, but weak laws and weak enforcement means that African Americans, Latino Americans, and other people of color suffer discrimination in hiring, in housing, in business, and in public services — and the racial wealth gap remains as the legacy of centuries of slavery and Jim Crow. In North Carolina, it’s legal to fire someone for being gay, lesbian, bisexual, or transgender — and our state’s legislators seem to always be looking for ways to permit even more discrimination. Democrats believe in equal justice for everyone under the law. We need to reform our criminal justice system to end racial disparities in policing, ensure equality for LGBT Americans, and end for-profit prisons and other “policing for a profit.” We need to strengthen and enforce protections against discrimination in the workplace, in housing, and in public services, so that everyone has an equal and fair chance regardless of their gender, ethnicity, disability status, sexual orientation, or gender identity. Here in North Carolina, voting rights are under attack. The ruling party keeps trying to make it harder and harder for ordinary North Carolinians to vote, with ever-more-restrictive voter ID laws, cuts to early voting and polling places, and myriad other efforts designed to deny the people of North Carolina their right to have their say at the ballot box. Their gerrymandering of legislative districts is so blatantly partisan that they’ve repeatedly been shut down by the courts. As a result, our purple state has a deep-red state legislature, where out-of-state billionaires and rabid partisans — not the ordinary people of North Carolina — are calling all the shots. Democrats believe in government of the people, for the people, and by the people. North Carolina’s legislators shouldn’t get to choose their voters… we the voters deserve the right to choose our legislators. 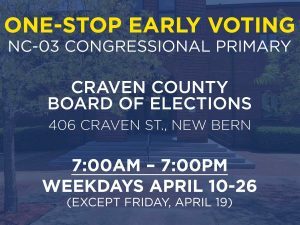 Every single eligible North Carolinian has the right to vote in a fair, clean, honest election — an election that can’t be bought or stolen by deep-pocketed outside interest groups and that can’t be cancelled by partisan or racial gerrymanders.